While Saga might be the belle of the comics ball right now, Brian K. Vaughan does manage to find time to work on other projects. One such project is We Stand Our Guard with Steve Skroce--a project which has been sent back to a second printing by Image Comics. We Stand Our Guard #1 second printing will hit stores October 7 (alongside We Stand Our Guard #4). We Stand Our Guard #1 remains available for purchase across all digital platforms. We Stand Our Guard #1 second printing (Diamond Code AUG158130) has a final order cutoff deadline for retailers is September 14th. We Stand Our Guard #2 (Diamond Code JUN150510) and We Stand Our Guard #3 (Diamond Code JUL150548). We Stand On Guard #4(Diamond Code AUG150498) has a final order cutoff deadline for retailers is September 14th. New York Times bestselling and multiple Eisner-award winning writer Brian K. Vaughan (SAGA, PAPER GIRLS, PRIVATE EYE) and legendary storyboard artist Steve Skroce’s WE STAND ON GUARD’s action-packed military thriller about a future where a heroic band of Canadian civilians must defend their homeland from invasion launched to critical acclaim this summer and has been rushed to a second printing in order to meet customer demand. 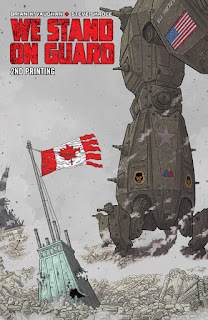 In WE STAND ON GUARD #1, it’s 100 years from now and a heroic band of Canadian civilians must defend their homeland from invasion… by the United States of America! The hyper-detailed combat between badass freedom fighters and giant f***ing robots begins in this spectacular 40-page first issue. WE STAND ON GUARD #1, 2nd printing (Diamond Code AUG158130), arrives in stores on October 7th. The final order cutoff deadline for retailers is September 14th. WE STAND ON GUARD #2, (Diamond Code JUN150510) and WE STAND ON GUARD #3 (Diamond Code JUL150548) are available now. WE STAND ON GUARD #4 (Diamond Code AUG150498) will be available on October 7th. The final order cutoff deadline for retailers is September 14th.